I don’t even remember where I got this book or how long I’ve had it. I saw it yesterday and thought I’d go through it since I’m trying to eat healthier and eat less carbs and sodium. And if you’re like me, you like quick and easy, few ingredient healthy recipes. This book is loaded with them. I love cookbooks that include photos. While I would have liked more, the book did have some bright colorful ones scattered here and there. I always like seeing how my food looks compared to the photo. Of course most of the time mine isn’t as pretty. The book includes a No Stress Shopping List, Handy Substitutions, Microwave Cooking Chart For Vegetables, and Metric Equivalents. I very rarely use my microwave, but the chart would come in handy if I wanted to microwave some veggies and the substitutions and metric equivalents are ones I need all the time. 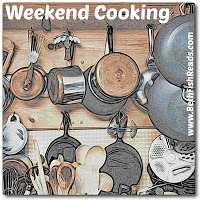 Each recipe has nutritional information, WW points and exchanges. My book is the fifth printing (2005) and is in like new condition. I don’t know why I haven’t been using the heck out this book. It’s great for anyone who wants to eat healthier, not just for someone wanting to loose weight. I’ll be posting a few recipes from it soon. I have always found the WW recipes to be fairly reliable. 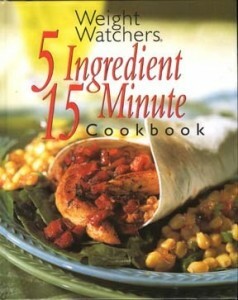 I agree that this looks like one those cookbooks you could turn to regularly — esp. on busy weekdays. I’ve never really tried any WW recipes, but the ones in this cookbook look really good. This has the advantage of sounding delicious, and being quick and easy. Plus not too long with the oven on. Particularly in this heat. Hi Claudia~ I use my turbo convection/toast/oven for almost everything I bake. It also has defrost, broil, warm, pizza settings. It’s large enough to fit even a 9×13 pan but doesn’t heat up the kitchen even when I use the bake option. I love it! I like this one! We are trying to eat a bit better as well. I actually pulled out my old weight watchers point calculator the other day to see how many points were in the Chobani yogurts! This sounds like a winner! Good food and healthy — that’s what I’m always looking for. I wish I liked grilling more than I do. This does sound like you could just roast it in the oven though. I’m a big fan of WW recipes and have their Simply the Best cookbook on my shelf. Haven’t used it in a while – definitely time to take a fresh look at it! That is my kind of cooking – quick and healthy and yummy! It’s always fun to revisit cookbooks. Fast and easy sounds good to me.